Cooking for yourself or your family can be an enjoyable pastime for you, but it’s sometimes a hassle to start up your oven for a small meal. One way to avoid that is to use a countertop oven. But then, what is the best countertop oven? We’ve taken a look and we’ve created a list of some of the features that you should consider before buying one too. These features will help you narrow things down, even if you don’t decide to go with one of our top choices. 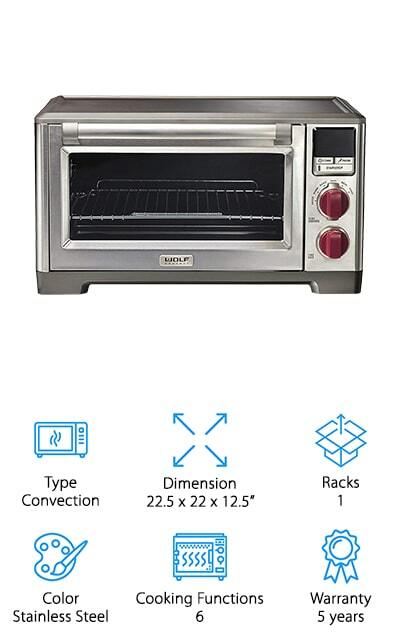 Type: What type of countertop oven is it? There are a number of different types of ovens, like convection, toaster and rotisserie ovens. Each one has different capabilities, which makes it more useful for you. 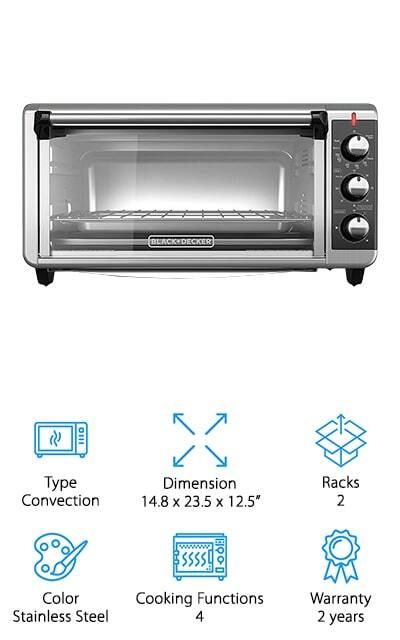 Dimension: How large is the oven? You want something that will easily fit on your countertop. After all, you want to make sure you aren’t taking up too much space. You want to have plenty of room to do other things. Racks: How many racks are there in the oven? There is a range of different sizes available and they have different numbers of racks. Not to mention the different racks allow you to cook different things at the same time. Color: What color is the oven? If you have a certain look for your kitchen, you’re going to want something that fits that same scheme. That means you’ll want something stainless steel or black or white to match. Cooking Functions: What kind of functions is it able to do? Is it able to do a range of different functions or only a couple? You want to take a look at the overall number of things that it’s able to do so you can choose what works best. Warranty: What kind of warranty is included? You want to make sure you have something durable, that’s going to last. A long warranty means that the company stands behind the product and it’s going to last. When it comes to getting the best possible product you want to look at the options. Each of the different countertop ovens we’ve found here will give you some great features. The best thing you can do is look through each countertop oven review and see how they’re going to help you. You’ll be able to make great meals for your family or for yourself, without having to worry about the regular oven in your home. This isn’t quite a commercial countertop oven but it definitely is one that you should look at for your own home. It’s available with 2 different color accents to match your kitchen look plus it has plenty of features to make sure your food cooks just right. You’ll get an integrated temperature probe for meat, a powerful fan to circulate heated air and precision temperature control. On top of that, you get 3 different rack positions to cook anything you want. Designed with 6 different cooking modes so you can bake, roast, proof, warm, broil or toast, you’ll be able to make all of your favorite meals in this thing with no problem at all. Just slide your food on the rack and cook it up the way you like. Our budget pick is a stylish convection oven that will give you a French door opening and an extra-large one at that. When you check the countertop oven reviews, you’re going to see why this one is such a top pick as well. You won’t have to spend a lot of money, but you’re getting a stainless steel system with 2 separate racks so you can cook just about anything you want. A single door pull will allow you to open both doors so it’s more convenient to use and you get digital controls for cook time and temperature. The Turbo convection means that it cooks your food quickly and makes sure that it’s browned and ready. You’ll also get a 90-minute timer that has a signal and it even turns off automatically so you don’t have to worry about safety. Cooking your food is definitely going to be easy with this system because it actually delivers power as you like it. If you adjust to different temperatures it even remembers for you so it can cook the same way next time. 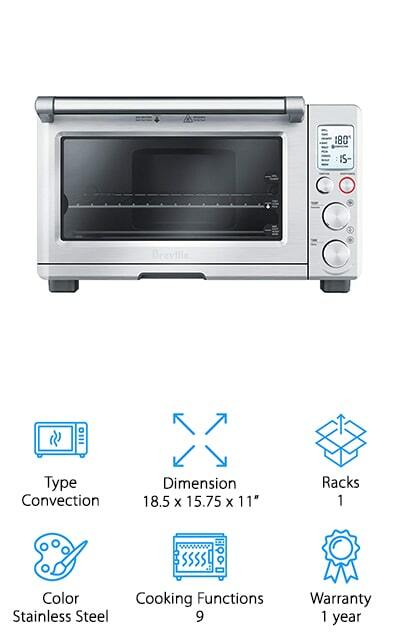 You’ll get 9 different cooking functions including toast, bake, roast, pizza, cookies, reheat, bagel, warm and broil. That means you can make just about anything you could possibly want and your family is going to love it. The backlit screen is LCD and it actually changes color so you know when the stove is one and running. It also comes with a 1-year warranty so you know this stove is going to keep working just the way you expect it to, for a long time to come. Okay, this isn’t a Wolf countertop oven review, but it is a great review for a great product you won’t want to miss. You get a European convection oven here that gives you more even cooking and you’ll get a heat lock system that keeps the temperature inside where it should be, releasing up to 50% less through the glass door. With 4 different positions for the 2 included racks, you can cook just about anything and even cook multiple things at once. You’ll also have 8 different programs to make sure you cook the way you want too. The 24 liters of space on the inside and the light inside mean that you can always see what’s happening without having to open the door. You’ll also have knobs to adjust for everything from light to temperature to function and an LCD screen to let you know the settings. Here we have a small countertop oven that’s actually even more sleek and elegant with the dark stainless steel. 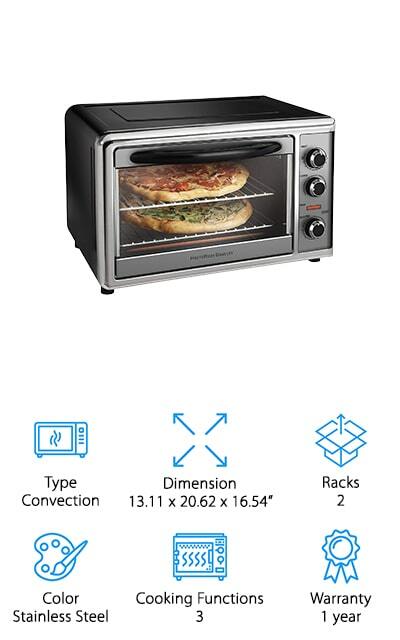 This toaster oven can fit up to a 12” pizza with no problem and has a single rack that you can move to several different places. You’ll have 11 different programs built right in so you can get the right cooking style for your favorite foods and you get an LCD display that makes sure you know what the current settings are for whatever you have inside. A baking pan and pizza pan, as well as a dehydrator rack and a wire rack are included in the set, so you’ll even be able to get started cooking right off the bat, without having to worry about finding the right dishes to use inside. 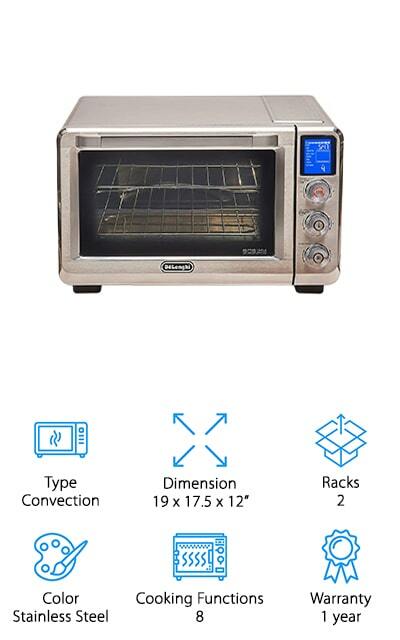 This unique convection oven is definitely something you’ll enjoy setting up on your counter. The teal color is a lot of fun, but if it’s not quite for you there are several other color options that you can choose from as well. On top of that, you’re getting a 12” system that’s able to cook a large pizza with no problem. The even heating technology also means that you’ll have consistency for everything that you cook. On top of that, you get 9 different programmed functions included and a 120-minute timer with a signal. A 12” multipurpose pan and a 12” broiling rack and cooling rack are included so you can get started cooking your favorite meals right away. Plus you can enjoy the fact that it’s super simple to use and set up all the controls you need. This might be your best countertop oven for baking or maybe for a rotisserie because it can do just about anything you want. Able to hold up to 2 12” pizzas or even 2 9”x13” casseroles, this is definitely a larger convection oven you’re going to want to keep out. It has a revolving rotisserie that can even self-baste and it has everything you need to start your cooking. You’ll have a drip tray, the rotisserie skewers and lifter, 2 different oven racks and even 2 different baking pans, plus a broiler rack. This oven comes with a 1-year warranty that lets you know it’s high quality and it’s designed to last. You’ll have 3 different knobs that can control everything from the temperature to the cooking time to the setting that you want to put it on. 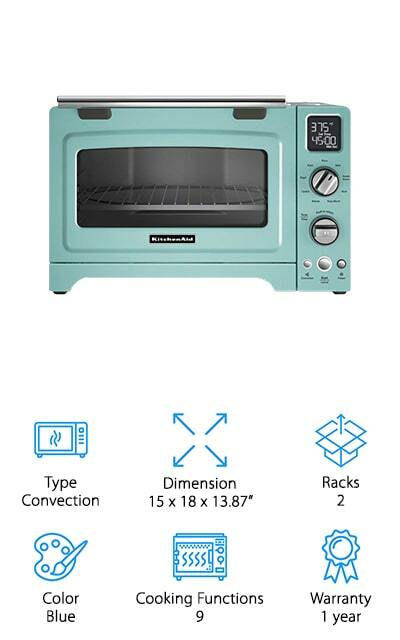 This countertop oven definitely looks interesting and it can provide you with a lot of features. Large enough to hold a 12” pizza it also has the ability to act as a rotisserie for your next chicken or turkey. 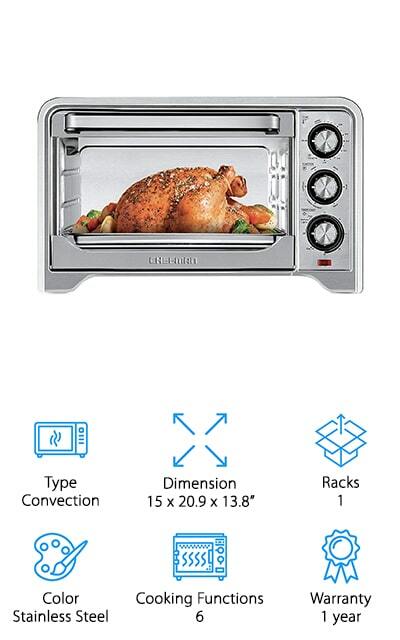 The features include grilling, baking, broiling, steaming, rotisserie and even toasting and you’ll be able to swap back and forth between any settings that you want easily. You’ll have an oven-top grill and griddle that’s protected by a domed lid and the additional features inside the oven. 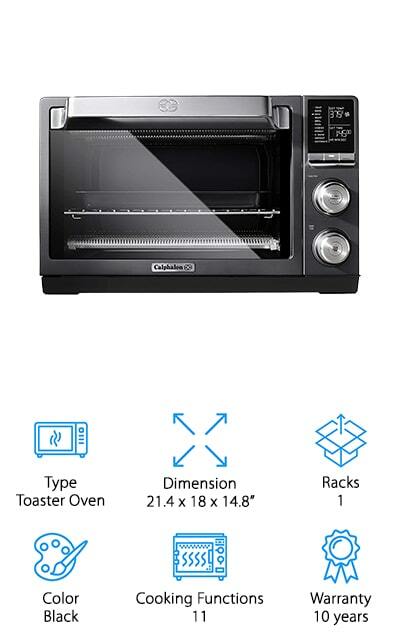 If you’re looking for something that can just about do it all this might be the exact oven that you want to start with. It’s definitely unique and it’s designed to make sure you can cook anything you want without needing any other tools. 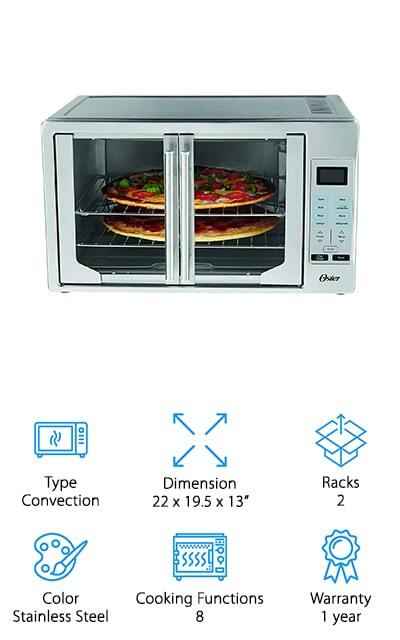 This Black and Decker countertop oven 12 pizza capacity is something you won’t want to miss because it can cook anything that you want in just about any style. It’s an 8 slice oven and large enough to fit your 9”x13” pans for casseroles and more as well. On top of that, you can put most of your pans inside here and you can use the included pans if you’re not sure. Designed to circulate warm air all the way through to keep the cooking even, it can also toast, bake, broil or just keep your food warm. This oven is designed in a sleek black and stainless steel to make a perfect look on your counter. It also has a 60-minute timer that will allow you to keep it on when you need to bake something even longer. On top of that, the racks connect in 3 different locations to cook larger dishes. 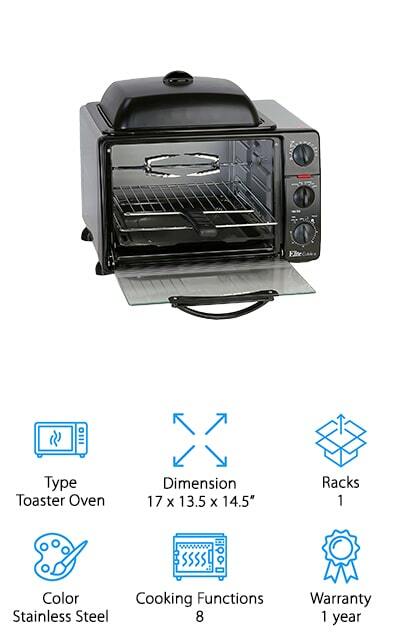 You’ll have 6 different features available with this toaster oven, which allows you to bake, toast, keep warm, defrost and broil as well as convection baking. On top of that, you can adjust the temperature from 200° to 450° for your own specialty cooking or settings. The 30-minute countdown timer has a bell to let you know when your food is done and the crumb tray makes sure you have an easier time trying to clean things up when you’re done. With this system, you can even put the crumb tray, the baking tray and the wire racks directly into your dishwasher to make the process even simpler for you and to make sure you’re ready for the next time you want to use it.